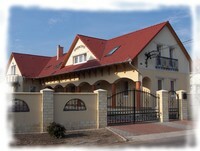 The newly built pension is opened in March 2007, and it's in the garden city of Sárospatak. Our first class, elegant pension is waiting for those guests who give preferences for the silent environment far away from the swarming, noisy city cetre. 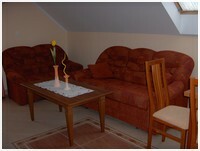 The rooms with high standards and nice furniture provide the comfort for our guests. 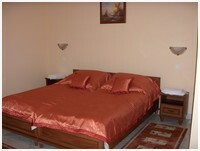 The pension tahat can sleep 22 with 5 apartments and a coffee bar is waiting for the people who would like to have a rest. 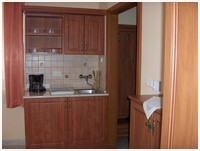 There is equipped kitchen in every apartment, the board is self-supporting or provided at the near restaurants. For the guests who come by car there is a car park. 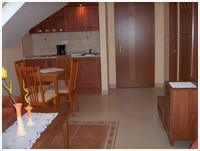 The rooms are waiting for the guests with shower, toilet, kitchenette (electric hub, refrigerator), TV and internet connection. Our coffee bar (with roofed terrace) is availabale for conference room for presentations, meeting, further educations and for friendly and family gatherings. 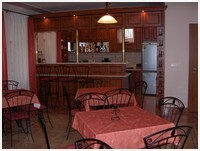 One of our amartments is availabale to host disabled persons too. Pictures are in the Photogallery!